In cooperation with Alcatel Lucent Bell Labs researcher from AMO realized the worldwide fastest Graphene based photodetectors. By demonstrating a maximum data rate of 50 GBit/s a new record level could be reached, pushing this technology closer to applications. Graphene, a two-dimensional layer of carbon atoms, is currently one of the most promising materials for future ultrafast and compact telecommunication systems. With a very high charge-carrier mobility and a broadband electro-optical response it can be integrated in large-scale silicon based systems. 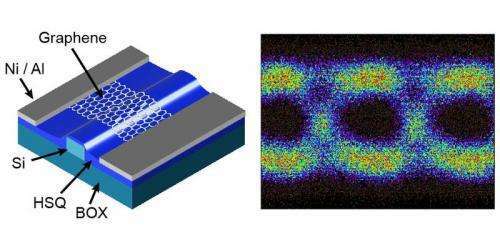 In the current work Graphene based photodetectors were integrated in a conventional silicon photonic platform, designed for future on-chip applications in the area of ultrafast data communication. In addition the specific features of Graphene-based photodetectors like dark current free and high speed operation and the CMOS-compatible large scale integration could be utilized. With this step ahead researchers at AMO and Alcatel Lucent Bell Labs could not only set a new benchmark for graphene based photodetectors, but also demonstrate for the first time that Graphene based photodetectors surpass comparable detectors based on conventional materials concerning maximal data rates. The work was supported by the European Commission through the Flagship project "Graphene" and the integrated project "Grafol" as well as the DPG supported project "GraTiS". The publication is published in the international renowned journal ACS Photonics and was chosen as Editor's Choice article.